By all indications, bears are extremely intelligent and most have individual personalities. To learn about traveling, fishing and camping in bear country, see: Living With Bears. 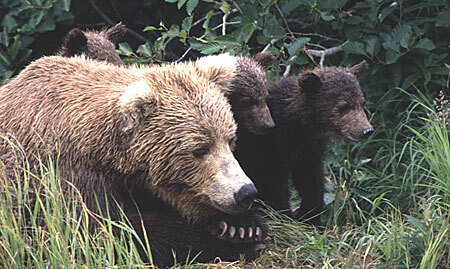 Brown and grizzly bears are classified as the same species even though there are notable differences between them. Kodiak bears (brown bears from the Kodiak Archipelago) are classified as a distinct subspecies (U. a. middendorffi) from those on the mainland (U. a. horribilis) because they have been isolated from other bears since the last ice age about 12,000 years ago. “Brown bears” typically live along the southern coast of the state where they have access to seasonally abundant spawning salmon. The coastal areas also provide a rich array of vegetation they can use as food as well as a milder climate. This allows them to grow larger and live in higher densities than their “grizzly” cousins in the northern and interior parts of the state. To minimize confusion, this report uses the term “brown bear” to refer to all members of Ursus arctos. Brown bears are very adaptable and like humans, they consume a wide variety of foods. Common foods include salmon, berries, grasses, sedges, cow parsnip, ground squirrels, carrion, and roots. In many parts of Alaska, brown bears are capable predators of moose and caribou, especially newborns. Bears may also be attracted to human camps and homes by improperly stored food and garbage as well as domestic animals. Although generally solitary in nature, brown bears often occur in large groups in concentrated feeding areas such as salmon spawning streams, sedge flats, open garbage dumps or on whale carcasses. Because of this, they have developed a complex language and social structure to express their feelings and minimize serious fights These feeding concentration areas also provide opportunities for people to watch bears. Cubs are born in the den during January and February. Twins are most common, but litter sizes can range from 1 to 4. When the cubs emerge in June, they may weigh up to 15 lbs (7 kg) and they actively explore their world under the constant supervision of their mothers. Mothers can be furiously protective of cubs, however less than half of the cubs survive. Families typically stay together for 2 or 3 years and after separation female cubs tend to stay near where they were raised while males go farther afield. Most brown bears are sexually mature at 5 years old; however females often do not successfully produce a litter until later. The mating season is in the spring (May to July) and they are serial monogamous (have one mate at a time, but several each year). The oldest brown bear in Alaska was a 39 year old female, while the oldest male was 38. In the winter when food is unavailable or scarce, most brown bears enter dens and sleep through the winter. Although this is not true hibernation, their body temperatures, heart rate, and other metabolic rates are drastically reduced. While in the den they do not eat, drink, urinate or defecate. Pregnant females are usually the first to enter dens in the fall. These females, with their newborn cubs, are the last to exit dens. Adult males, on the other hand, enter dens later and emerge earlier than most other bears. In northern areas, bears may spend up to 8 months in dens, while in areas with relatively mild winters, such as Kodiak, some male bears stay active all winter. Brown bears have an exceptionally acute sense of smell, exceeding that of dogs. Contrary to popular belief, bears are not nearsighted. Their eyesight and hearing are comparable to humans. They can run in short bursts up to 40 mph (64 kph) and are excellent swimmers. By all indications, bears are extremely intelligent and most have individual personalities. Brown bears (Ursus arctos), also known as grizzlies, occur throughout Alaska except on islands south of Frederick Sound in southeast Alaska, west of Unimak in the Aleutian Chain, and Bering Sea islands. They also occur in Russia, northern China, northern Japan, Europe, western Canada, and in limited portions of the northwestern United States. Spring: In spring, black and brown bears are usually found on low elevation south-facing slopes, and in riparian forests and wetlands for early green vegetation and moose. Summer: During summer, brown and black bears are most commonly found in mid-elevation herbaceous habitats, in low elevation river bottoms and fluvial benches for early berries, and in high elevation burns and openings for berries. In some areas they also focus on anadromous waters for salmon. Fall: In fall, brown and black bears are most commonly found on large rivers for salmon and associated riparian forest areas for roots, late berries and fruits. In the Interior, bears focus on alpine and subalpine berry patches. Winter: In winter, most brown bears are in hibernation dens in alpine and sub-alpine areas; most black bears are in dens in forests. Bear populations in Alaska are healthy and productive. Densities vary depending on the quality of the environment. In areas of low productivity, such as on Alaska’s North Slope, studies have revealed bear densities as low as one bear per 300 mi2 (777 km2). In areas abundant food, such as the Alaska Peninsula, Kodiak and Admiralty Island, densities as high as one bear per square mile (2.6 km2) have been found. 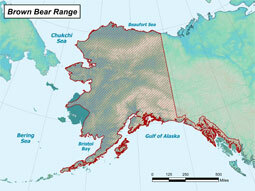 In central Alaska, both north and south of the Alaska Range, bear densities tend to be intermediate, about one bear per 15-25 mi2 (39-65 km2). These figures do not mean that each bear has this much territory for its exclusive use. The area occupied by any individual bear overlaps those used by many other bears. Contrary to popular belief, bears are not nearsighted. Their eyesight and hearing are comparable to those of humans. Brown bears can run in short bursts up to 40 mph (64 kph) and are excellent swimmers.